There is enough pressure to just be an MLB outfielder but imagine being the hand-picked successor for one of baseball's greatest hitters. That was what Carl Yastrzemski had to face when he took over left field for Ted Williams, but he ended up having a career that was nearly as great as the Splendid Splinter's. As the face of the Red Sox for more than two decades, Yaz's baseball cards are some of the most sought-after of the era and the following top list will point you in the direction of his finest cards. 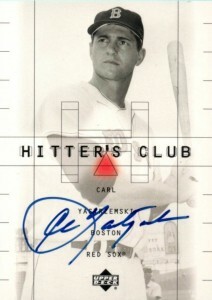 Shop for Professionally Graded Carl Yastrzemski Cards on eBay. Playing an amazing 23 seasons for the Boston Red Sox, Yastrzemski was an 18-time All-Star and he earned seven Gold Gloves roaming the outfield at Fenway Park. He's still the all-time leader of many offensive categories for the Red Sox, including hits, runs, and RBIs. Yaz will always be remembered for his amazing 1967 season in which he won the Triple Crown, a feat that wouldn't be matched for 45 years. He would finish his career as the first player to combine 3,000 hits with more than 400 home runs and his election to Cooperstown in 1989 was nearly unanimous. If you don't have many Card Yastrzemski cards in your collection yet, he has many memorable cards outside of this list and several of them are found at budget-friendly prices. Take a look at Yaz's cards in 1964 Topps Giants and 1969 Topps Deckle Edge for two very unique cards. Another oddball card that turned out very beautifully was Yastrzemski's 1976 Kellogg's 3-D Super Stars that could be found in cereal boxes. Yastrzemski is also one of the few players to be given a Topps #1 when he led off the 1969 Topps on a card that highlighted the 1968 batting leaders. 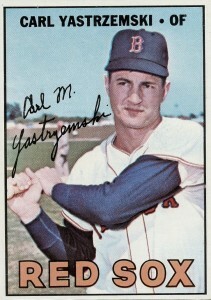 Yaz was the only batter that year who had a batting average above .300. Look to 1983 Topps for his last Topps card as a player but his overall final player card is in 1984 Fleer. Incredibly hard to pull, an amazing Yaz autograph can be found in packs of 1992 Score Series 2. A diamond in the rough of junk wax, the Franchise Players insert card features triple autographs by Yastrzemski, Stan Musial, and Mickey Mantle. By the end of his long career, Carl Yastrzemski played in the second-most games in baseball history. That translates to a lot of baseball cards. When compiling this top list, value was as a major factor as well as individual card design and the card's importance in building a comprehensive collection. 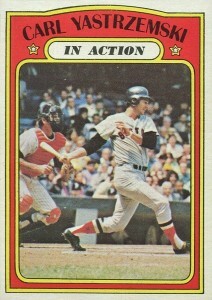 The 1972 Topps set included many memorable In Action cards and Yastrzemski's is one of the best and most beautiful. You even get a guest appearance by New York Yankees catcher Thurmon Munson, who's watching the ball sail away from him. A few things stand out on the 1967 Topps Carl Yastrzemski card. Collectors may learn that his middle initial is "M" for Michael, and it is also evident how much his signature changed over time between this card and the #3 entry on this list. His 1967 Topps card was also featured in the 1987 Topps set as one of the "Turn Back The Clock" cards highlighting the events from twenty years earlier. An interesting little Yaz collecting project would be to pick up all three of his "leaders" card highlighting his Triple Crown-winning year. To do that, look to 1968 Topps and cards #2, #4, and #6. 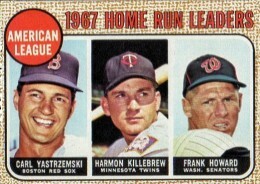 Over the three cards which highlight the batting, RBI, and home run leaders, it is also clear that Frank Robinson and Harmon Killebrew had great 1967 seasons as well. 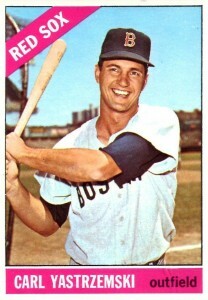 Topps used the same photograph for both the 1963 and 1964 Topps Yastrzemski cards and only his 1963 appearance is documented here, but both cards could serve as great budget-friendly examples from the early part of his career. 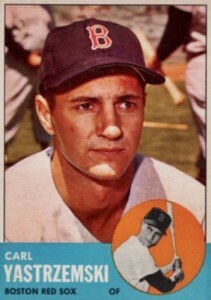 Nearly all of Carl Yastrzemski's cards before his 1966 Topps appearance featured him with no expression or an outright frown. That trend changed when this card arrived and showed him looking like one of the happiest baseball players to have ever played the sport. It is a must-own for collectors looking to add a bit of sunshine into their collection. Yastrzemski strikes one of the more memorable poses in baseball card history on his 1965 Topps card as he seems to be tracking down a pop fly. Unless the idea is that he is waving off another player, it is an odd catching stance for an outfielder to raise both his hands. Either way, Topps enjoyed it so much that they included this photograph in the American League batting leader card in the 1966 Topps set, making for yet another odd-looking card. 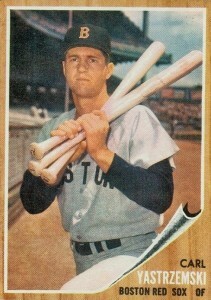 After having painted cards in the 1960 and 1961 Topps sets, Yastrzemski was full-color in the 1962 Topps set. This is my personal favorite card as it features a great photograph of Yaz holding three bats at once. It's also the first Topps card that represents his time in the majors as his earlier Topps cards feature minor league stats. Autographed Card Yastrzemski cards continue to be included in recent high-end sets (including 2015 Panini Cooperstown) and so collectors can find signed cards fairly easily. A great Yaz autograph can be found in 1999 Upper Deck Hitters Club and it is a rare vertical-designed card that offers plenty of space for the on-card signature. 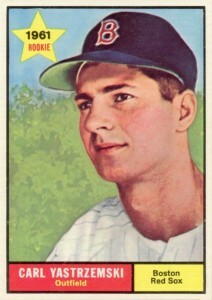 1961 Topps saw Yastrzemski awarded the Rookie Star designation even though he didn't actually play for the Red Sox in 1960 (more on that at the #1 spot on this list). The back of his card shows his AA stats from the minor league Minneapolis Millers. Highly-graded version can still reach $200+ for Yaz's second-year card. The relationship between Ted Williams and Topps was always a tenuous one and, in 1959, Williams would even have his own Fleer baseball card set. Topps was logically very eager to have the next Red Sox star locked down. 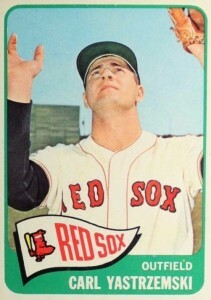 They were so eager, in fact, that they would feature Yastrzemski in their 1960 Topps set even though he wouldn't play for the Red Sox in either 1959 or 1960, spending both years in the minors. 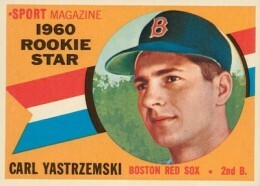 This makes Yaz's first card a true prospect card in the tradition of Bowman sets many decades later. 1974 Topps #280 Carl Yastrzemski Red Sox HOF PSA 9 MINT " LOOKS NICER "
1963 Fleer Carl Yastrzemski PSA 5 EX #8 Baseball Card HOF Boston Red Sox Nice !! VINTAGE ORIGINAL 1964 TOPPS CARL YASTRZEMSKI #210 NM+ BEAUTY RED SOX HOF YAZ !! Red Sox Splendid Splinter subset.